Last you heard from me, I was frozen in at Scholar Green on the Macclesfield canal. The cold loosened its grip on Britain and as the temperature rose I knew I could move on once more with the help of friends. And what friends I am fortunate to say! Besides the four who turned up over a period of four days to help me with locks, I had emails, Instant Messages, and texts from many others offering assistance if no one else could come. Every one of them from boaters. And those who did show up?? Boaters who live in houses in the winter feeling the need for a canal fix! No matter how inclement the weather, they were happy to help and pleased to be out locking and walking along the cut. Boaters are an odd lot; while most folks aim to stay inside where its warm and dry, we are out in all weathers, cruising, locking, walking and happy to be out in Nature's abundance. I made a pot of Chicken Noodle Soup to provide a hearty nourishing lunch for my helpers. Thursday last, I left Scholar Green at 9 am after filling up with water and bundling my rubbish up for dumping at Red Bull Services a mile and half ahead, emptying the bilge and greasing the stern gland. While I was waiting for the tank to fill, the CRT barge came by as I was setting the lock for me, so I helped him through. Happy to chat, the bloke called me sugar as in "Sugar you take good care of yourself and take those locks easy." It always amazes me that British men can call a woman sugar, love, hen, ducks, etc. and it never sounds condescending. It is a simple term of endearment. American men could never get away with it! I said goodbye to Richard and Alison on NB Wild Rose, the lovely couple moored up near me. Alison locked me through and took my email so we could keep in touch. Boaters are such lovely people! Alison and Richard Palmer's boat Wild Rose moored near me at Scholar Green. Scholar Green stop lock in the setting sun. The canal is frozen! This is what the inside of single pane boat windows look like after a bitter cold night at 10F/-12C! And this is a window inside that has been covered with insulating plastic. When I covered some of the windows with plastic, I noted the temperature in the boat rose by 10 degrees! It really does make a difference. The CRT barge breaks ice back down to Red Bull Services where they have a work shop and wharf. The CRT employee on the right is phoning in my complaint about the orange caution blockade. He was told to tell me to walk down to the next bridge behind me to access the street. Well gosh, that is the bridge that is closed due to falling bricks and it has an orange caution blockade too! 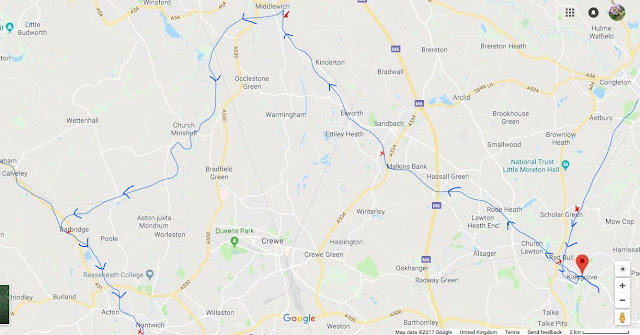 Soon enough I cruised the one mile to the junction of the Macclesfield with the Trent & Mersey canal and turned left to moor up at the top lock on Heartbreak Hill which is comprised of 22 sets of mostly double locks dropping 300 feet over thirty miles. Friends Chris and Andy Thorp of NB Ceiriog soon came along the towpath, took windlasses and off we set! The sun was shining and the wind bit my hands with cold as I broke ice from lock to lock. Making excellent time thanks to Chris and Andy's help we knocked out 12 locks and I was moored up in Rode Heath by 1:30 pm. We shared a lunch of homemade chicken soup and seeded rolls, and a good chinwag. Andy reckons they have traveled up and down Heartbreak hill in the triple digits which means they know this stretch of canal quite well. Andy and Chris Thorp (NB Ceiriog) gracing me with their help and friendship. I was planning to do the next four locks into Hassell Green on my own the next day but the temperatures, which had warmed up the ice and melted some of the snow in yesterday's sunshine, had plunged during the night. I woke Friday morning to find NB Val literally coated in ice, like a flash frozen Salmon. The towpath was treacherous and it took until 1:30 pm for the temperature to rise high enough to begin melting the ice sufficiently that I could break it up and sweep it off the boat. I wasn't going to take chances with my well-being at slippery locks so I walked over bridge 140 and caught the bus into Sandbach for a grocery top up. Back home I spent the rest of the evening cooking Mexican food--soul food to me--and something I often turn out for family holidays like Winter Solstice. I made a dozen Green Chile burritos and a pan of Sour Cream Chicken Enchiladas. I whipped up some fresh Guacamole and Pico de Gallo as well. It is the most I've cooked since Les died, with the exception of catering his memorial service back in March. Ken and Sue Deveson (NB Cleddau) bringing love and good cheer along with some help for the locks. Soon enough we were plowing along in the rain, breaking ice which was hidden underneath the surface rain water on the canal. The boat handles differently in ice, slowing down against it, taking more time to respond and often not going where one wants it to on curves and bends, as the ice refused to give sideways. Approaching locks I had to go forward to break ice with the bow, then back up into the open water behind me and swing the boat around. With Ken and Sue's help we traveled down fourteen locks to moor up in the quickly approaching dark at Wheelock. We ate a hasty meal after which Ken managed to call a cab in a dead zone for phone service, go back to Rode Heath for their car and drive it down to Wheelock to pick up Sue. Boaters aren't the only crazies out enjoying the cut in this weather! Approaching a bridge. See the ice partly submerged by the rain? Out of one lock and into another! An excellent view of the double lock sets that are distinctive to Heart break Hill. Coming out of a lock near Malkins Bank. Sue set the lock ahead while Ken worked me through this one. Cruising along a straight bit of long pound between locks. They left for their B&B accommodations and I hunkered down for the night in the rain, remembering when Les and I had moored up nearby at Malkins Bank through Bridge 151 back in 2012 and caught the bus into Sandbach. I was still new enough to this country to be utterly charmed by the chocolate box cottages backing onto the canal, across from the bus stop into town. We had a memorable day mooching around Sandbach and I found a deli that carried steel cut or Pin head oats as they call them over here. I hadn't been able to find any in Tesco or the other local grocery stores so I stocked up, buying six bags! We ate lunch at Casa Mia. I ordered Les a caramel latte which is what he drank when we were in the States and I remember the look of happy satisfaction on his handsome face carved with laugh lines. Usually he frequented Greggs and drank a plain American coffee--cheap and cheerful. I was on a mission to convince Les to upgrade to some of the better things offered in life. We were so happy that day. We had only been married a year and one month and life was bright with promise. I wrote about our visit in a post titled The Bluebird of Happiness. "Jaq your tank is full of sludge at the bottom. I can feel it. When was the last time you had the fuel tank cleaned?" "Never. Les said as long as we kept it topped up and used Fuel Set to kill diesel bug we would be fine." "Jaq you need to get it cleaned. You've got just under half a tank and there is a very thick layer of crud down there." All righty then, one more thing to add to the list along with a new stern gland, both of which will be addressed just after the new year. At the moment it was time to empty the two 25 liter jerry cans of diesel I had on hand for emergencies using with the nifty tool Les built for me to siphon the diesel out of the cans and into the tank without having to lift the cans out of the locker and tip the diesel into the fuel tank opening risking spilling it over the stern counter and into the cut. The two jerry cans full of diesel I keep for emergencies and the Ikea bag with Les' final project inside. The long copper tube (right) goes inside the jerry can. The short copper tube (left) goes into the diesel tank. There is a long length of black hose connecting each length of copper tubing and a small pump attached with an on/off switch and a 12 volt plug in. To others this may look like a mechanical gadget. To me this looks like true love. This project was the final thing Les did for me before he died, working on it at the dinette while humming Chicago's famous love ballad "If You Leave Me Now." Les stopped working to take some Morphine for pain, gazing at me with such love and longing in his eyes I wanted to stop breathing and stay caught in this moment with him forever. I knew he was thinking " I Love you so Jaq and I don't want to leave you." He rested his head against my chest as I stood holding him fast against my beating heart, as if I could somehow keep his heart beating with the depth of love and longing in my own heart. Then he raised his head, smiled sadly at me and said, "I need to finish this for you, my baby. It makes me happy to know this bit of kit will make life easier for you." I pulled the Les Biggs Super Duper Siphon Kit from the stern locker. Ken took one end and dropped it into the diesel tank. I took the other and inserted it into the first jerry can and plugged it into the 12 volt plug just underneath the hatch cover. Ken flipped the switch and with quiet efficiency the diesel level dropped in the can as it was pumped into the tank, gratitude for Les' love spilling over me as I stood there. By 2:30 I was up through Wardle lock, off the Trent & Mersey canal and moored up at Middlewich. Soon after the Devesons slipped away and I settled in for a few days of rest. I checked in with the local fuel boat NB Halsall and to my great good fortune they were cruising by late Monday evening! Behind schedule do to a delay in fuel delivery at Calvely, they cruised late to make up time. I met them at 10:30 pm and soon my diesel tank was full again. After I paid my bill I handed over a foil wrapped package of Blueberry Lemon Cornmeal Cake as a thank you. Apparently the stress of 2017 has caught up with me in the waning days of this sad and tragic year. I am ill with the cold from hell which is fighting to settle in my chest and causing my throat to feel like slivers are being poked into it. I spent Monday and Tuesday wrapped up in the Great Woobie, pajamas and thick socks, curled up in Les' recliner sleeping between bouts of attempting to cough up a lung. I managed to walk in to the Tesco store in town yesterday afternoon for ginger Ale, cough drops, a roast chicken, and some bread. This morning I felt marginally better. I sat here at the dinette with Les' picture talking to him. "What you think Les, should we move? It is so warm (55F/12C) outside and there is not a breath of wind. It's so warm out I am letting the fire die down in the stove until this evening. I know you would be miserable in this heat. 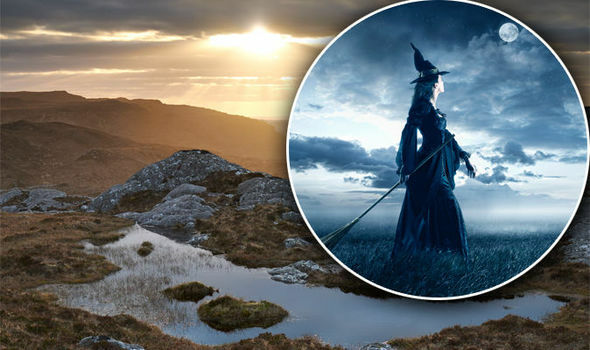 Even though it is Winter Solstice and a holy day for me as a witch, if you were here, I am certain you would say, "'Come on Jaq, let's move. We've been here long enough. Let's go find a quiet spot out in the country to moor on our own.'" So that is what I did. Up through Stanthorne lock at 11 feet one inch deep, on my own I cruised off for three miles to a place Les adored called The Flashes. (The link I have provided is to two past posts--one written by me and one by Les. His is so poignant it will make you cry; mine is missing some pictures for some unknown reason but the prose is still there. The picture of Les holding a freshly baked Chocolate Kahlua Cake and sniffing in ecstasy it is worth a Billion words!) The moorings are on a high embankment overlooking the River Weaver. The Middlewich canal below Stanthorne lock. NB Val coming up as I stand by the top lock gates waiting for her. Cruising away from the top of Stanthorne lock. NB Valerie is the only boat moored here in the quiet of the countryside at The Flashes. Views of the River Weaver from my mooring, stretching left to right. View of a farm on the off-side of the canal. No one in front and no one behind. A coveted beauty spot all to myself. This is what I call a "Les mooring." a view of The Flashes from the galley window. ...it is a Kingfisher, Les' favorite bird and it sat there on the branch for nearly fifteen minutes, a Winter Solstice gift to gladden my aching heart. When we moored here last in May of 2012 this was a 14 day mooring. Now under CRTs' ownership there are metal moorings rings every eight feet or so and it is posted, "48 hours only." Les would be appalled by this change. It isn't like this is the only beauty spot along this section of the cut where boats can moor up. There is plenty of space from bridge 14 though to bridge 22, so it feels to me like Continuous Cruisers are being hurried and harassed to move every two days; and when we do move that fast we aren't accurately tracked. I don't celebrate Christmas, not being a Christian. Les wasn't big on it either. Before me, he spent the holidays with family who refused to allow Les to be alone on the boat at Christmas and really, he did enjoy spending time with them. Once I came along, Les and I celebrated the Winter Solstice with a good dinner, and recognition and respect for the Turning of the Wheel of the Year. We didn't need any gifts because we had each other and all of our other needs were met. After tonight the light and the sun is returning as the days grow longer bit by bit; something to instill hope and look forward to in the depths of winter's cold. Blessed Be this Winter Solstice. I knew it was going to be COLD last night. I was sitting in Les' recliner watching the Blue Planet II on the BBC and the fire was burning merrily in the stove and suddenly I realized the tip of my nose was cold. I reached out a hand and I could feel the temperature changing in the boat. Now for those who don't live on a narrowboat, or who have never been on one--especially in winter--you should know that heat and cold lie in layers inside. Hot air rises and the warmest place on a narrowboat is always near the ceiling with the coldest being nearest the floor. The middle level of warmth begins on this boat at about my knees and rises to my neck when I am standing up; from the neck up it is quite hot. I am five foot one inch tall. Les was five feet nine inches tall and this why we argued about the heat on the boat all winter. More of his body was in the warm and hot layers of the boat. Being a short arse most of my body is in the cold zone nearer the floor. Anyway, last night I could feel the internal drop in temperature corresponding to a sharp drop outside around 8:30 pm. I knew the canal would freeze over and it did. I slept soundly in my Portuguese gray flannel sheets and winter down comforter. I woke this morning to a warm and toasty boat but the outside world was a different place; brittle with cold, clothed in a layer of dry frost crystals nearly three inches thick. At 6:30 am the thermometer read -8C/17F. I went outside with a broom sweeping down what I could and started the engine to make sure it was turning over. It will heat some water and bring the batteries to a full charge. I doubted the solar panels would generate any charge today but I swept them off as best I could. There was still a frozen rime of frost across the surface. I tried sponging it away with my lambswool cleaning tool and some hot water but it simply turned the frost to a frozen sludge. I managed to get most of it off but there was still a layer of almost opaque frost across all three panels. Never the less I came back inside, hung up my gear and walked back to the stern to check the battery charge and it warmed my heart considerably to see the solar panels were indeed making energy and my batteries were topped up to 13.5! The water point tap is frozen so that is my next chore. I am going to pour a kettle of boiling water over it to get the door un-latched and another kettle of boiling water over the hose pipe inside with the lever turned on and left in the on position. Soon enough it will thaw and begin running. It is a good day to have a tidy up inside while the sun is still shining; wash a load of clothes and hang them to dry, make a pot of nourishing soup and some bread--rye I think, and settle down in front of the fire with a book. Making a Run for It! As Scottish poet Robbie Burns wrote, "the best laid schemes o' mice an' men gang aft a-gley." In other words the best laid plans of mice and men often go awry. That's what happened with me and my plans to come off the Macclesfield canal and quickly work my way down the Trent & Mersey's Heartbreak Hill to Hassell Green. Another word for it is weather. While I was enjoying the weekend painting course at Bollington Wharf, the weather was conspiring against me. Damn Gina! Tuesday morning, moored up at the top of Bosley locks, I had a grocery delivery from Ocado. Friends Amy and James Tidy appeared and at 11 am we began moving down the 12 lock flight at Bosley. Hugging them goodbye at the bottom lock, I cruised off through the cold and headed back down towards the beginning of the Macclesfield canal. This is a narrow, shallow canal that winds through some spectacular countryside, passing through the town of Macclesfield which I will be sorry to leave behind. It is a lovely place with good shops and restaurants and small town feel even though it is a market town with a population over 52,000. If you ever find yourself there be sure to have lunch at Silktown Fryer on Castle street. You can go in the left door and order a takeaway or enter the right door and sit down in their cafe which is bright, very clean, and the service is excellent. But the fish and chips are why we are here and they are divine!!! I know it is probably sacrilege to say I am not a fan of Britain's favorite fast food but I always find the fish greasy and the batter claggy. Most chips are just so-so. The Cod as this establishment was encased in the most amazing batter. It was well coated, crispy and brown, but light as a feather and there was not one drop of grease pooling on my plate. The chips were hot, golden and delicious. Right, back to cruising: I left the top lock at 11 am and arrived at Scholar Green near the stop lock and the water point at 3:48 pm--just as dusk fell. that was five hours of continuous cruising with winds gusts of 30 mph grabbing at the boat. My hand was locked around the tiller like a corpse with rigor mortis. By 3 pm I was shivering with the cold. My down jacket while warm, is not water proof. Five hours of perspiring in it made it damp on the inside. My fingers were numb at the very tips despite wearing Alaskan mittens and I was knackered which always makes the cold worse. From the bottom of the Bosley flight to Scholar Green is twelve miles and in all of that stretch--not counting boats moored permanently year around--I only saw 15 boats moored up. I was the only boat on the move the entire time. The cut seemed abandoned and empty in the diluted light of a gray day in which the sun came out briefly once I reached Congleton and then teased me through a mast of clouds as it quickly dropped lower in the sky, affording no real warmth. I did stop in the bridge hole at bridge 85 to step inside, have wee, stoke the coal fire and turn the Ebispacher diesel heater on to heat the indoor rads. I was about 45 minutes away from Scholar Green and I wanted the boat toasty warm inside with plenty of hot water. I find stopping in a bridge hole on a very windy day for a quick dip inside is a good way to do it barring any boats following or approaching. The bridge hole keeps the boat from being buffeted about by the wind and allows one to take off cruising again without having to regaining control of the boat. At my destination I moored up about five feet from the bow of another boat with its bow pointing towards mine. Behind him was the open mooring for the water point. I figured my 125 feet of hose should reach the tap and I felt bad about mooring so close to the other boat but it is winter and needs must. No telly to be had in this cutting so I didn't bother putting up the antennae. Inside I stripped off my outdoor gear, lit a fire under the tea kettle, hung my damp things to dry and climbed into a scalding hot shower to thaw out. Ten minutes later I was nice and warm in clean, dry clothes with a mug of hot cherry and cinnamon tea. Darkness closed around NB Valerie and me. Thursday arrived and the weather forecast was for even higher winds straight out of the north with very cold temperatures. Neither materialized in this safe little pocket just outside the grip of the Cheshire Gap. 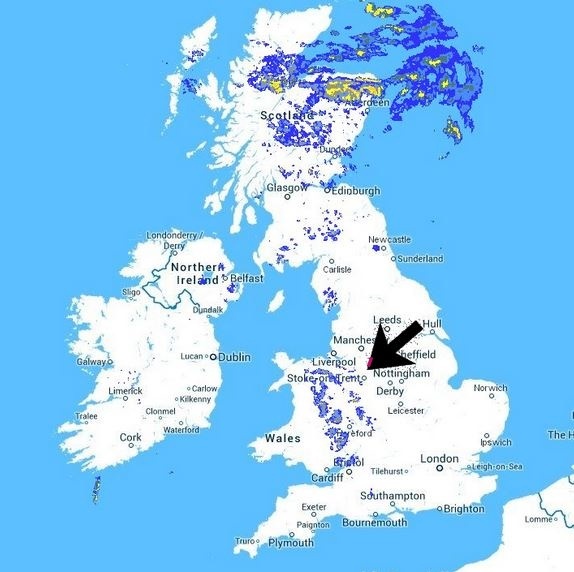 Meteorologists use the term Cheshire Gap when referring to the lowlands of the Cheshire Plain, providing as they do a passage between the Clwydian Hills, in Wales on the one hand and the Peak District and South Pennines on the other. (The Macclesfield canal travels along the Eastern edge of this gap, rising 118 feet with the Bosley lock flight to run cheek by jowl with the hills of the Peak district.) Weather systems are often guided down this "gap", penetrating much further inland than elsewhere along the coast of the Irish Sea way off to the west of my location. The black arrow marks the Cheshire gap and the tiny pink mark at its leading edge marks my current location. Friday dawned and the wind arrived although not the 60 mph gusts predicted; the boat rocked with the gusts and the water in the canal rippled into waves and still three boats came through the stop lock heading towards Congleton. I had arranged for friends Chris and Andy Thorp on NB Ceiriog to lock me down the first twelve in the flight of Cheshire locks on the Trent & Mersey known as Heartbreak Hill but I had contacted them on Wednesday and canceled. I didn't want to anyone to risk their necks on my account. Friday night the snow began, timidly at first but by Saturday morning there was an inch and half of heavy, sticky snow on the ground--and the boat. I threw on my cold weather gear, filled a bucket with hot water and grabbed my Flow Through cleaner bought at a Caravan supply shop last summer and out I went to clean the snow off the solar panels. Once they were clean and dry I tackled the stern and the bow. Using my Caravan Flow Through Cleaner with a lambs wool on the end to clear the solar panels. The handle holds water sucked up from the bucket through the lambs wool end. Job done! I love this telescoping handled cleaner and my collapsible silicone bucket. Les nearly had a heart attack when he saw the price of the bucket--£11! It has been worth every penny and collapses down to a slim disc easily stowed away. A Canal and river Trust (CRT work barge laden with new lock gates for the work on the Bosley flight just after Christmas. These small blue bargettes are the work horses of CRT. They push and pull larger barges laden with muck, oak lock gates and everything in between all along the cut. Back inside I tidied up, put my winter gear on again and headed off down the towpath to the bridge behind me, I was gong to walk to the Coop store 6/10th of a mile away on the A34 for my Saturday paper and some bits and bobs. As I rounded the bend of the towpath I spotted orange caution netting and boards stretched across the towpath cutting it off through the bridge hole. Approaching the closure I looked up at the bridge to see a huge chunk of bricks missing. Something had struck the bridge and broken the wall, the bricks tumbling down onto the towpath. Right so back I went the way I cam, passed my boat to look up and see--another closure just past the water point! It wasn't there when I moored up on Wednesday. I approached it to find the same detail of orange caution netting hanging from boards running across the towpath cutting me off from the ramp up to Moss lane and the A34. Now I understand why there was a caution closure back behind me near the damaged bridge but this closure by the water point is absolutely ridiculous!! The broken bridge is 2/10th of a mile away from the closure by the water point. Health and Safety have gone overboard, closing the towpath so far ahead of the actual issue that they have blocked off the egress to buses and shops for live aboard boaters who may well find themselves stranded by snow and ice, and made it dreadfully hazardous for boaters stopping for water. The closure near the water point--2/10th of a mile before the actual bridge site in need to attention and closed off at its end with a similar structure. I had to climb part way over the right end of the boards on the up-slope side to gain access to the ramp up to Little Moss Lane and the road to the shop. The view back down the ramp! The footpath between two houses that leads to the ramp out os sight off to the left. Behind me is Little Moss Lane and the way out to the shops. This trek to the Coop shop is 6/10th of a mile one way and wouldn't you know it but there is also another caution and blockage on the sidewalk ahead!! Now you can see the gap between the first caution closure and the actual construction site farther on. What a bloody waste of space and time. I swear Health & Safety assumes Brits are stupid, brainless twits. A warning sign at the site of the first closure and this closure at the actual work site is sufficient to notify pedestrians so that we can look ahead for a break in the traffic, step out around the mess and back onto the sidewalk farther on. The Co-op is just beyond, where the car is parked. A brilliant idea! Re-purposing old red phone boxes for other use: this one has a Defibrillator inside. NB Valerie moored beyond the blue boat at Scholar Green. The post in the foreground is the water point. The actual damaged bridge with a caution closure is on around the bend and out of site beyond NBV by 1/10th of a mile. Once back from the shops I pulled out my hose to make sure it would reach NB Val from the water point and to my dismay I was 8 feet too short! Thee was nothing for it then but to move around the boat moored in front of me and moor up again with part of NBV on the water point mooring. Still there is room for one 72 foot boat or two smaller boats to moor in front of me for the water point and the stop lock. I am getting antsy sitting here second guessing the weather. It has snowed all day Saturday and today is Sunday. The snow still falls although now it is small, dry flakes. I have repeated the cleaning of the solar panels, washed clothes, and generally tried to keep things cleared off outside in the hopes I might be able to head off soon before I do end up frozen in here. Below is a screen shot of the Met Office weather forecast for today and next week. It looks as though I could make a break for it once again about Thursday. I am frustrated and I will admit it--I am frightened--at the thought of traveling down through 36 locks and 44 miles to get to Nantwich. I am constrained by time due to the winter closures of locks on between Red Bull and Hassall Green which take place just after Christmas. Les had years of experience with winter weather on the cut. We were such a good team. I could trust his judgment. If he said, "I Know what the weather service forecast but I think we are safe to go down as far as Wheelock," off we went and I could have the greatest confidence in Les' judgment. I have no confidence in my own judgment. This is my first winter on my own. I don't mind moving in winter but I cannot afford to get iced in somewhere for very long without water and shops. I am fortunate in having many good friends--boaters all--who have offered to help me down these locks. I just need to say "Okay we're setting off on this day," and they will be there for me. I don't want to risk their safety and well being in weather that could put them at risk either because all of them are driving to get to me. Here is the route I need to follow. The arrows indicate the direction I am traveling .The red X's mark the water points along the way. There was no way for me to mark the locks. Patrick and Angela on NB Chouette in their Guernsey sweaters. They keep their boat moored up at Heritage Marina about a mile and half back behind me. I passed their boat on Tuesday afternoon but no one was on board, It turns out they arrived within minutes of my passing. Clued into my whereabouts by mutual friends Sue and Ken Deveson, Patrick and Angela hiked down to say hello and check in in me to make sure I was okay. We sat with tea and had a lovely natter. I look forward to getting to know them both better. The good news? I am warm, I am dry, and I do not lack for anything other than the confidence to know when to move.